Looking forward to having them back with us in the future. A great group to work with! My clients absolutely loved the show! Mark Sonder, MM, CSEP and the Chief Entertainment Officer at the award winning music and entertainment agency Mark Sonder Productions, Inc. is proud to announce that the 2014 On Broadway Tour of Linwood Peel's Stars from The Drifters has added more large and small scale meetings, conventions, trade shows, expositions and special events across the US. "This seems to be the year for corporate and association meetings and events using headline entertainment, and we're glad that in our 29th year we are here to serve our core clients and their needs," said Sonder of his company and the economic climate in general. Sonder continues, "The LPS Drifters are a fine example of a favorable priced group with name cache that have brought their audiences to subscribe to the concept of everything old is new again." And the LPS Drifters bring it with their tunes, "This Magic Moment," "Up on the Roof," plus many Motown hits as well. What are people saying about the LPS Drifters? Linwood Peel's Tribute to Drifters were amazing and you could tell the audience LOVED them! Thank you again and I hope to work with you again in the future." "Great show last night in Dover! You had crowd of 500 on their feet shakin’ & breakin’, singing n swaying with rockin’ rhythms. For more than 2 hrs, your soulful performance brought back youthful memories. Thanks for a wonderful good time!" --John Jones writing on Linwood Peel's Tribute to The Drifters Facebook Fan page regarding one of the shows in Dover, Delaware. "Looking forward to having them back with us in the future. A great group to work with! My clients absolutely loved the show!" 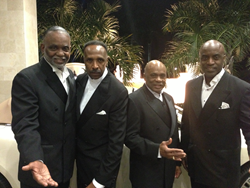 Call today to book Linwood Peel's Stars from The Drifters +1-540-663-1640. Created in 1985 to fill a growing need for music, entertainment, speakers, headline entertainers and supportive production in corporate and association meetings, conventions and special events plus facilities, casinos and concerts, the company 29 years later has worked in the US, Canada, Mexico, South America and Europe.